Anonymous provided this edifying read. It ‘trumps’ what happened with the first tower built at Orewa, and the Spencer on Byron at Takapuna (referred to elsewhere at What if?, or google) – as far as 41 Wharf Street, Dunedin is concerned the tower-scam model is the same. So here we are, naive and wide open to the wiles of our own ‘good old boys’ and their unsavoury quest for a share of dirty-quick money from fickle overseas ‘connections’, and your life savings too. Plans for a 28-storey waterfront hotel towering over Dunedin have been dealt a blow by a Dunedin City Council report that criticises the design and recommends resource consent be declined. 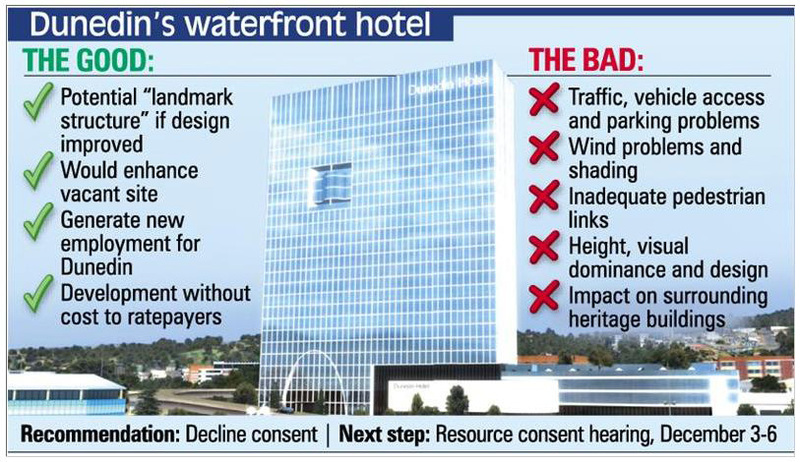 The report by council planner Lianne Darby, made public yesterday, identified the hotel’s height and dominant appearance as among areas of concern. A host of technical worries also raised doubts, ranging from traffic problems and shading to a lack of information about wind gusts magnified by the tower’s height. Ms Darby’s report left the door ajar by including a list of detailed conditions to impose if consent were granted, despite her recommendation. Note to graphic: Under the Resource Management Act (RMA) the commissioners to hear the application cannot consider the economic viability of the proposed hotel project – the matters with a red cross, at right, fall within the scope of the Act. The applicant is required to show the adverse effects of the proposed development are no more than minor. 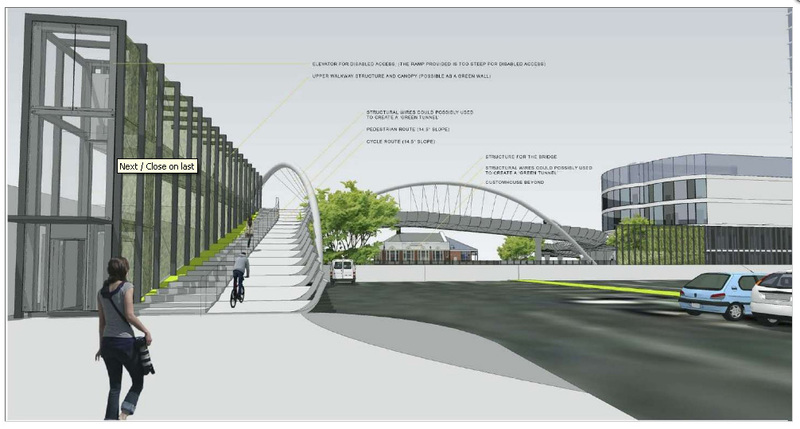 ‘New information’ about the hypothetical footbridge cannot be considered at hearing since it was NOT included in the notified application. 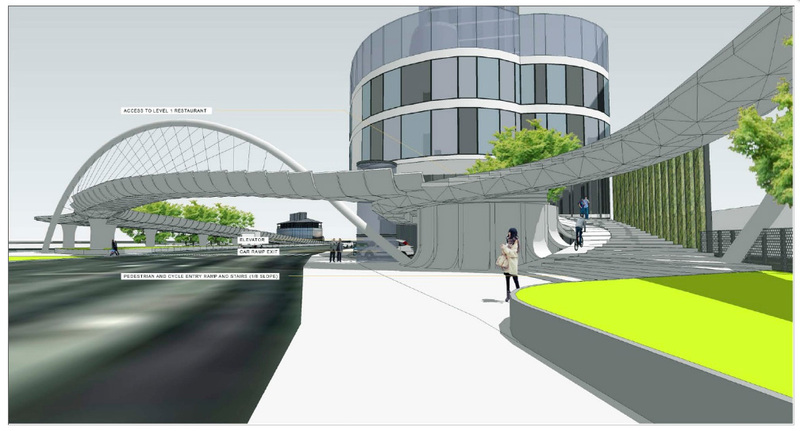 The man promoting Dunedin’s proposed 28-storey hotel has unveiled plans for a “world class” pedestrian and cyclist bridge that could provide a missing link to the city’s waterfront. However, the idea is only the “starting point for a discussion”, with key details – including how much the sweeping structure would cost and who would pay for it – yet to be confirmed, Betterways Advisory Ltd director Steve Rodgers said. Submitters should have received their copy of the Council Planning Report and Hearing Committee Agenda today by mail. Note: Submissions and the summary of submissions are available to view at the website. • Application does not include sufficient information about construction methodologies or storm water disposal. • Application states that no additional resource consents are required when it appears that is not correct based on the information provided. There is not sufficient information to make a determination on the necessity for resource consents from the ORC such as for the discharge of contaminants during construction. 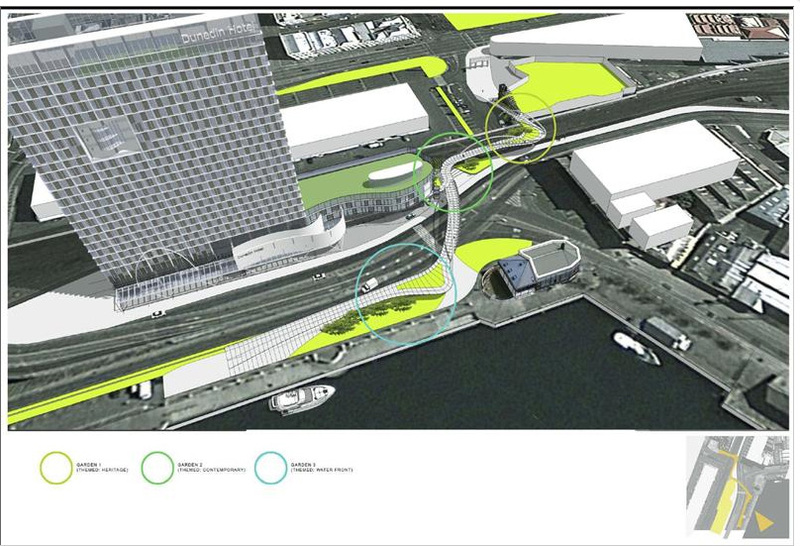 • Custom House Quay was developed as an open and inviting public space and gifted to the City of Dunedin and Otago Region and the proposal will have significant adverse effects on this open public space through shading and due to its scale and dominance. • Applicant statement about shading effects is false and is misleading in terms of accurately quantifying the effects of shading on public spaces. They are significant and adverse. • Will likely result in significant changes to vehicle traffic and pedestrian flows. Concerned about the effect on ORC properties. Limited information has been provided and traffic emanating from the site will likely impinge on the ability of pedestrians to safely cross land in the vicinity. • Particular concerns regarding the safety effects on Wharf Street resulting from the intensive use of the site, the access arrangements to and from the site and the adequacy of the proposed car parking. • Application does not include any detail about existing car parking demand. • No wind tunnel assessment has been done despite the applicant stating it is the only accurate way to predict a building’s wind environment. • The proposed post construction monitoring and subsequent wind assessment is completely inadequate as a mitigation measure. • Due to the scale and location it will result in adverse visual effects that are widespread far beyond the industrial zone itself. • Has ignored design aspects that synergise with the new harbourside precinct in particular the height of buildings. • Landscaping will provide very limited mitigation in terms of amenity planting along the Wharf Street carriageway. • Application does not provide sufficient detail about the proposed construction methodology or timeframe involved in construction. • Will likely involve heavy pile driving. The effects of noise and vibration have the potential to be significant and adverse. • The failure to properly assess and identify whether ORC consents are required may mean that the cumulative effects of the proposal are understated and therefore the full gamut of effects arising from the proposal have not been properly accounted for within the assessment of environmental effects. • Concerned with the site’s susceptibility to liquefaction and proximity to faults. • A comprehensive geotechnical assessment of the subject site should be undertaken by the applicant. • Site may be subject to wave run up during a high magnitude storm surge event, if sea level continues to rise. • Application is contrary or inconsistent with the objectives and policies from the New Zealand Coastal Policy Statement, the Otago Regional Policy Statement and the Dunedin City District Plan. • In respect of the NZCPS, it compromises recreational and landscape values, is inconsistent with the existing built environment and gives rise to adverse visual effects. • Application is inconsistent with meeting the sustainable management purpose of the Resource Management Act. • Requests that the application is declined or amended so that all the concerns raised are suitably resolved. Chris, check out submission No. 422 by Madeleine Lamont. She includes sketch renderings of the tower in its landscape context. Madeleine, a Dunedin resident, has a Bachelor of Landscape Architecture (Hons) degree from Lincoln. 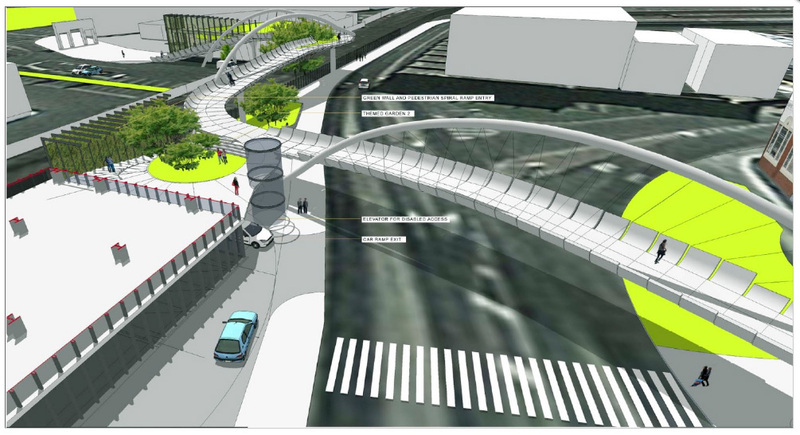 As for the waffle put together by Ian Munro as DCC’s ‘independent’ urban design consultant… this is someone paid by council to reinforce the need for a footbridge in order for the hotel tower to proceed, or so he thinks. There are major weaknesses and contradictions evident in his assessment of ‘urban design’ matters. There is a field day to be had at hearing, in response. Both assessments show hand-holding by DCC politicians/planners to treat the tower proposal (in the end, against all evidence to the contrary) favourably – it’s fairly clear from what’s been written (despite two very different styles of expression) that the architects discussed the application with the urban design consultant prior to sign off of the ‘independent’ reports. That’s what you do when DCC seeks an agreed outcome. “Will likely involve heavy pile driving. The effects of noise and vibration have the potential to be significant and adverse.” Remember the torture that people across the harbour endured for the long (and it must have seemed much longer than it was, to those affected) period when pile-driving for the Fubar Stadium was going on? They’ll be well happy to have a re-run of the experience, aye. Holy Crap ! Someone needs to somehow get Madeleine’s renderings out into the public arena. That shot from Mornington Park is soul destroying. Those images by Madeleine are the sort people need to see alongside the b.s. offered up by the hotel’s representatives. That big ugly square is a shadow maker and view killer. The reflection off that much glass will be blinding. 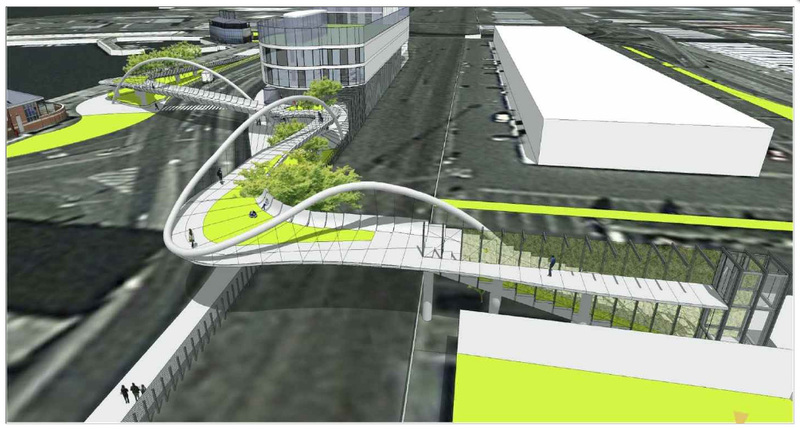 The footbridge is “needed” because of the choice to build this 5-star hotel on that particular site. The building has to be that size and shape because of the size and shape of the section. There’s no room for adequate parking – see above. I wonder if our council geniuses, grovellingly eager to get this “investment” in Dunedin and convinced of the need for a large amount of 4- and 5-star visitor accommodation, has had the nous or the nerve to say, Great idea folks, you’re very welcome, just not that fugly design there, because of [large numbers of reasons expressed clearly by non-council people to make up for shortfall of brain activity among dollar-blinded council elected & staff]. This is why I think there has to be something else going on behind the scenes – some sort of land swap deal. “We’ll go build a new City Office down there (maybe a 5-storey building or something), you come in here, demolish this concrete edifice and build your 100m hotel on top on sensible bedrock right next to a flash new conference facility. Yes, that’s the only way any kind of “logic” gets into the scenario. Remember, the INEPT CORRUPT counter-intuitive Dunedin City Council built the stadium. Nothing is too crazy or illogical by that standard. The only difference is the Council now has an acknowledged surfeit of debt and the (also acknowledged) complete inability to service it. Why hasn’t the ODT published these photos? Are they as sound asleep as old Tom Fraser is? Anonymous, I think there will be a land swap deal because these images (not photos) are showing that this hotel is looking more and more ridiculous. But why are the DCC going to so much trouble to turn attention away from one of their car parks? Are we the ratepayers going to be told next that the land at Wharf Street that is worth $360,000 and that they tried so hard to buy for years, is now going to be bought by us for $10 million. Who knows what the DCC are up to because they’ve never been honest with us. The Otago Daily Times should have contacted Madeleine, confirmed publishing rights and run with them across the front page. It’s that sort of news that sells newspapers. I guess the time frame was a little difficult and maybe they will go with it tomorrow? I’m not holding out any hope. That kind of enthusiasm for newsworthiness will probably upset a close friend or two. Don’t worry – all this will come out in the media before, during and after the hearing. Early days. Hearing starts Monday 3 December 2012, at 9am.